Red light tickets are considered “hazardous infractions”. Insurance companies may increase convicted drivers rates perceiving a higher risk of being in an accident or making a claim. “Every driver approaching a traffic control signal showing a circular red indication and facing the indication shall stop his or her vehicle and shall not proceed until a green indication is shown”. 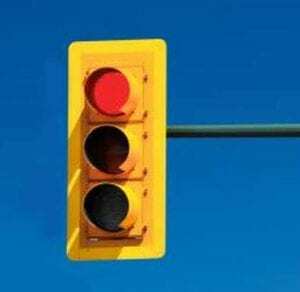 Meaning, where there is a red traffic signal the driver must come to a full and complete stop and may not proceed from that position unless the traffic signal is green. Where is the Driver Required to Stop? if there is no sign, marking or crosswalk, immediately before entering the intersection. Although the red light law says that the driver must stop for a red light, the officer or witnesses in traffic accidents must present evidence as to where the driver didn’t stop. e.g “the driver passed the stop line without stopping and entered the intersection on the red traffic signal”. Drivers with class G1 and G2 licences are suspended where they accumulate more than 4 demerit points. Although fighting a red light ticket may sound simple, just going to court and telling the Justice that you didn’t go through the light won’t get the ticket canceled. An explanation or “why you went through the red light” will not get your ticket dropped. You need a legal defence to the charge. Red light traffic ticket trials are won on properly cross-examining the police officer, arguing legal issues and properly giving your defence to the charge. Were the traffic signals working properly? If a car is traveling at fifty km/h, and an amber light is four (4) seconds long, how far, or how many feet does the vehicle travel in one second? As well as many other legal technicalities we can find to win your case. Many times people who witness traffic accidents will tell the officer that one of the vehicles went through a red light. But did they really see the driver go through the light or did they see the accident then look at the light and see that it was red? The court has to have evidence that the driver “entered the intersection” on a red light.